The purpose of this article is to help the user to configure the basic settings in Trezor Wallet. Using this tab, you can configure some basic settings after setting up your Trezor device. 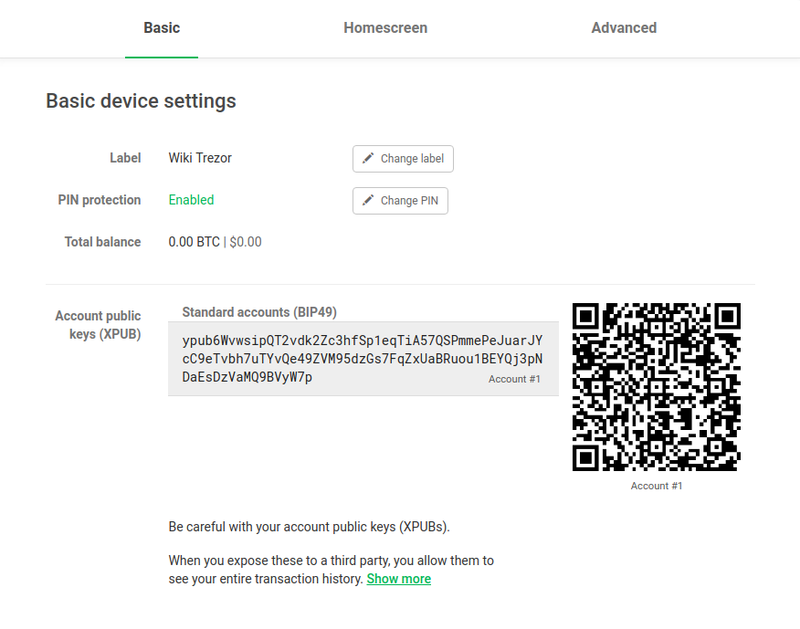 You can access Basic settings in Trezor Wallet by clicking on the name of your device and then clicking on the Basic tab (see also Getting to know Trezor Wallet). Below is a short description for each of the functions. In this section of the basic settings, you can change your device label. Click on Change label, type your new device label and click on Change. Confirm the action on your Trezor device. Done. You can now see the new name of your device in the top left corner of the screen (under the selected cryptocurrency). This section allows you to change your PIN (if enabled). Enter your current PIN using your Trezor device. Enter your new PIN using your Trezor device. Re-enter your new PIN using your Trezor device. Done. You have now changed your PIN. This section shows you the total balance of all your accounts using the selected cryptocurrency. You can see the currently selected cryptocurrency in the top-left corner of the screen. See also Switching cryptocurrencies. This section allows you to display your account public key that can be used to generate watch-only wallets in third-party services. For more information, see Displaying account public key (XPUB) and Compatible third-party wallets and services. This page was last edited on 28 March 2019, at 15:49.